A young boy wakes up to the sound of the sea, visits his grandfather's grave after lunch and comes home to a simple family dinner, but all the while his mind strays to his father digging for coal deep down under the sea. 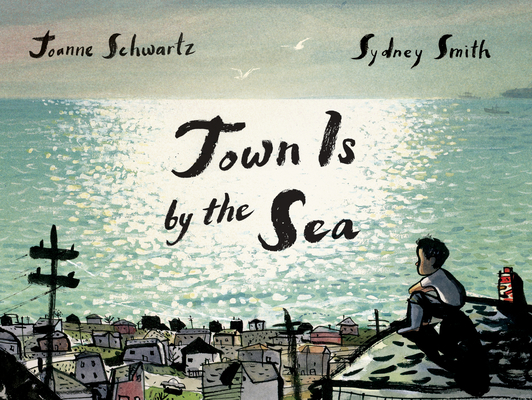 Stunning illustrations by Sydney Smith, the award-winning illustrator of Sidewalk Flowers, show the striking contrast between a sparkling seaside day and the darkness underground where the miners dig. With curriculum connections to communities and the history of mining, this beautifully understated and haunting story brings a piece of history to life. The ever-present ocean and inevitable pattern of life in a maritime mining town will enthrall children and move adult readers. Joanne Schwartz was born in Cape Breton, Nova Scotia. Her first picture book, Our Corner Grocery Store, illustrated by Laura Beingessner, was nominated for the Marilyn Baillie Picture Book Award. Her other books include City Alphabet and City Numbers, with photos by Matt Beam, and two Inuit folktales with Cape Dorset elder Qaunaq Mikkigak -- The Legend of the Fog, illustrated by Danny Christopher, and Grandmother Ptarmigan, illustrated by Qin Leng. Her most recent book is Pinny in Summer, illustrated by Isabelle Malenfant. Joanne has been a children's librarian for more than twenty-five years. She lives in Toronto. Sydney Smith was born in rural Nova Scotia and has been drawing from an early age. Since graduating from NSCAD University, he has illustrated multiple children's books, including the highly acclaimed wordless picture book Sidewalk Flowers, conceived by Jon Arno Lawson, which won a Governor General's Award and was shortlisted for the CILIP Kate Greenaway Medal. He is also the illustrator of Grant and Tillie Go Walking by Monica Kulling and The White Cat and the Monk by Jo Ellen Bogart. Sydney has received the Amelia Frances Howard Gibbon Illustrator's Award. He now lives in Toronto and works in a shared studio space in Chinatown.